Choose format and design. Fill up the online order form. Deposit payment. Expect the e-copy of your invite draft via email. Printing and Delivery. Click here to browse through our products. After choosing the perfect product that matches your preference, you may now start browsing for designs here. Click here to proceed to the online order form. Fill-up all the the necessary fields. After completion, click on the submit button. Once deposit payment is confirmed, you can expect an e-copy of your invite draft with 7 working days. Should there be any revisions on the draft, just email back your corrections and we will send the next draft within 7 working days. After submission of the completed online order form, you will receive a confirmation order receipt and a payment advice from us via email within 2 to 3 working days. Pay securely via bank transfer. Once deposit has been made, email back a photo or a scanned copy of the deposit slip. Once everything is okay, just send an email approval that the final draft is good to go for full printing production. You may expect your invite to be printed within 7 working days. Wingdingz Invitations is a printing service company that provides the widest range of design choices to meet every conceivable taste—from classic, formal, and traditional designs to the outrageous and unconventional. Our ever-growing portfolio is designed to overwhelm excitable clients with incredible possibilities of visualizing their personal style, and with brilliant, eye-catching graphics that are not offered elsewhere in the industry. As a service company, Wingdingz Invitations also caters to highly individualistic clients—those who want their designs to be personalized and unique in all the world. We are highly interested in ideas not only coming from artists, but also from clients themselves. We are powered by a diverse group of artists with varying tastes and styles. Our designs are individually created by many different artists and harvested by art directors who respect the uniqueness of each piece. In expanding and diversifying our portfolio, we will always invite artists and clients to make their special artistic contribution. Wingdingz is owned and managed by a printing press that has been in existence for more than 25 years, Design Plus. Design Plus avails of the latest in offset and digital-offset printing technology. The elimination of the "middle man" enables us to keep our prices competitive and product delivery faster. Welcome to Wingdingz Invitations. Feel free to browse through our website for information and updates. If you have any inquiries, please do not hesitate to contact us. Happy preps! "The thing we love about Wingdingz: they give and do what you want, they are prompt, give quality personalized service, are professional and very accommodating"
"We are so happy and proud for all of your achievements. Well deserve, we won't be surprise if you will be the no. 1 choice of Invitation supplier soon (as in very soon)... Keep it up and more more one of a kind designs to come =)"
"I super, duper, major, major love our invitations! I just hope that I had time (money) to add a little something extra to it just as I had originally planned, like adding an obi belt touch to it. In any case, it is as Japanese as it can get =)"
"thanks to you guys.. dami nagandahan sa invites namin.. invites palang ulam na..hehehe.. sa uulitin =)"
"got our invites yesterday.. thanks to wingdingz.. ang bilis nagawa ang yung outcome exceeds our expectation.. "
"Got our invites and we are soo happy with it! Thank you soo much Geri! More power wingdingz! You guys are the best! :)"
"We love our invitation. It's so simple yet so unique and super love the colors looks like candy, yummylicious haha. Good work WINGDINGZ." "Thank you so much Dennise for the very wonderful invites!!! 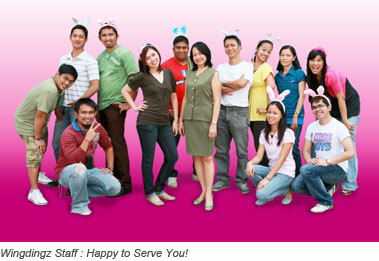 :)"
"Thank you so much, Dennise of Wingdingz Invitations for a super stress-free transaction!" "Thanks so much Wingdingz.. I love the invitation.."
"wingdingz, thank you for our very beautiful invitations. sobrang na-amaze ang aming mga guests. special thanks to denise and geri =)"
"thanks! super love our invites!" Wingdingz Pocket Savers is the cheapest and fastest option for budget conscious and time-presured clients. Simply choose your format, design, and fill up our form or give us a call. You’ll receive your invitation in as fast as seven working days. Wingdingz Premium provides 2500+ template options for clients to personalize under the guidance of a professional graphic artist. With Wingdingz Premium, the client enjoys extensive customization priviledges with unlimited revisions. Wingdingz Lovebook is the quickest way to transform your favorite digital photos into a fantastic photobook that will surely amaze your friends and loved ones. Immortalize your memories. Retell your stories.